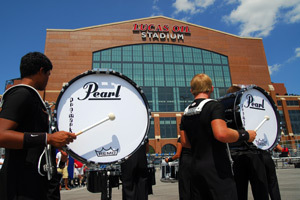 With the World Championships slated to be held in Indianapolis at Lucas Oil Stadium through 2018, Drum Corps International is already working ahead toward 2010 and beyond to continually improve and refine the championship experience for fans and performers alike. 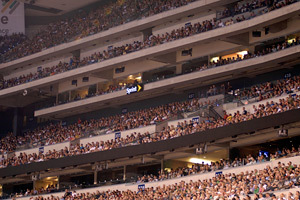 "It's always an exciting challenge to stage a major event like the World Championships in an unfamiliar stadium for the first time," said Drum Corps International Director of Events Sue Kuehnhold about the 2009 DCI Tour. "From Gillette Stadium in 2005 to Rose Bowl Stadium in 2007, and even longtime locales like Camp Randall Stadium in Madison, each venue comes with its own set of logistical considerations that must be addressed as a part of the event planning process. Even as a state-of-the-art facility, Lucas Oil Stadium was certainly no different this past year." 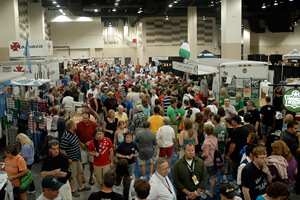 Kuehnhold noted some of the most prevalent issues expressed after the 2009 World Championships included the quality of sound in the stadium, the configuration of seating locations and the new indoor placement of the "Festival Marketplace" where corps set up their souvenir trailers and were joined by many DCI corporate partners in an exhibition hall environment. "Unlike previous seasons where we were 'one and done' in a Championships venue, we now have the incredible opportunity to return to Lucas Oil Stadium for several years. We can build on the lessons we've learned and continue to refine our operation to ensure an incredible World Championships experience for everyone," said Kuehnhold. In just a month following its biggest series of annual events, Drum Corps International has initiated an unprecedented outreach program to solicit comprehensive feedback on the World Championship events in Indianapolis from 2009 "FANtastic 5" ticket purchasers and its Friends of DCI donors. An in-depth online survey will be launched in the coming week to those who attended the '09 World Championships, specifically those who were registered as "Super Fans" during the week's events. 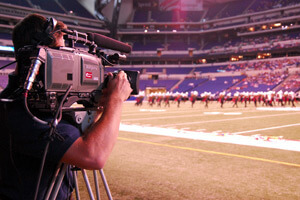 Results from these efforts will be compiled, studied and addressed as part of ongoing discussions among the DCI Board of Directors, members of the DCI professional staff, representatives from Lucas Oil Stadium and the City of Indianapolis and event volunteer coordinators; with each entity committed to the continuing development of the partnership supporting DCI in its Indianapolis home. The results of the survey will also be shared with the voting membership of Drum Corps International at its annual business meeting in January. "Moving forward we know that the quality of sound inside the arena is a top priority for everyone," said DCI Director of Marketing Bob Jacobs. "We're working to address all of the issues related to the quality of the listening experience from many different angles simultaneously. We're engaging top experts in the world of commercial sound and the recording industries, some of whom also possess a strong background in the unique requirements and opportunities created by our elite units. "We're also soliciting input from seasoned professionals within our world, including veteran and Hall of Fame program designers and corps directors, each of whom have tremendous insight and experience with staging performances in a variety of different environments," says Jacobs. "Each perspective is unique and necessary in order for us to make sure that we're doing everything possible to ensure that we're creating the spectacular World Championships showcase that our corps and fans deserve." FANtastic 5 ticket packages for the 2010 World Championships (Aug. 12-14) which include seats at all five World and Open Class events to be staged at Lucas Oil Stadium are now on sale. Single event tickets will be available through Ticketmaster in November. "With our first series of events in the new stadium under our belts, we're now far more familiar with the specific details relating to the various seating areas," said DCI Ticketing Manager Kristi Armstrong. "We're now better equipped to help our fans to select seats that will provide them with an optimal viewing and listening experience customized to their personal preferences." An important part of any visit to a Drum Corps International Tour Event is a trip through the "Festival Marketplace," where corps assemble to sell T-shirts, hats and commemorative mementos. The location also gives corps the opportunity to distribute membership information while maintaining a direct point of contact for interaction with supporters. "Our opportunities for merchandising were plentiful at Lucas Oil Stadium, but caused us to think creatively about how to best serve the needs of the corps, the fans and our corporate partners," said John DeNovi, DCI's director of business development. "We had the opportunity to bring souvenir managers together in Indianapolis prior to the start of the 2009 Tour, where they were able to take time considering the traffic-flow and make decisions on how to maximize opportunities for the corps to raise much-needed funds while also providing the fans with a positive experience." Corps opted to take advantage of spacious exhibition space built into the "event level" of Lucas Oil Stadium where they were able to set up their souvenir trailers in an indoor setting replicating the open-air environment typically found at the DCI World Championships. Additional retail space was created through the introduction of the "Team Store," located in the stadium's north concourse, featuring corps and DCI Championship apparel in a "pro shop" environment for the first time. A third satellite location was created on the upper level of the stadium as a convenience to fans seated in that area. "We were concerned that economic challenges could adversely affect the sale of souvenir merchandise this season," said DeNovi. "But we were very pleased with the results from the Championship events, and many of the corps have reported successful results as well. We're going to continue to work with the souvenir managers and corps directors from each of the units to maximize the opportunities provided by Lucas Oil Stadium. Once we've had the chance to assess the data we'll be gathering as a part of our post-tour research, we'll be able to continue to refine our operations to provide improved opportunities for the corps and a positive experience for the fans and corporate partners." Even with all eyes looking ahead to the planning of the 2010 Tour, DCI is also working to officially close out the calendar on the 2009 season with the upcoming release of its annual World Championship CD and DVD products. A four-CD-set including all 22 World Class corps will be available on Oct. 8 with anticipated availability of all DVD editions (three volumes including all World Class corps and Open Class Finalists) on Nov. 15. All items are now available for preorder at store.DCI.org. This season marked the very first time the World Championships were produced and recorded entirely in high definition, and since August, veteran producer Tom Blair and his crew have been hard at work on the first-ever HD mastered recordings. While a Blu-ray product will not be available on the initial release date, he says that even the standard definition DVD will have a better, clearer picture when produced with the native HD footage. And along with picture, Blair is excited about the audio which will once again be available in Dobly Digital 5.1 Surround Sound. "The recordings sound so great, and this clip of Carolina Crown from the Finals is just in regular stereo ... the surround mix is even better! " Blair said. "Between the look of the stadium on the screen, the astounding quality of the audio and the excellent performances of the corps, this is going to be one of the best Drum Corps International DVD sets ever."